What was the apogee of U.S. nuclear excess? Numerically speaking, one could argue that it was in the 1960s, when the overall size of the U.S. nuclear stockpile peaked, or in the 1980s, if we’re counting the number of warheads associated with strategic nuclear delivery vehicles. In terms of U.S. declaratory policy, I would argue that the peak period of U.S. reliance on nuclear weapons came briefly in 1954, when Secretary of State John Foster Dulles (above, on another occason) rolled out the doctrine of massive retaliation. 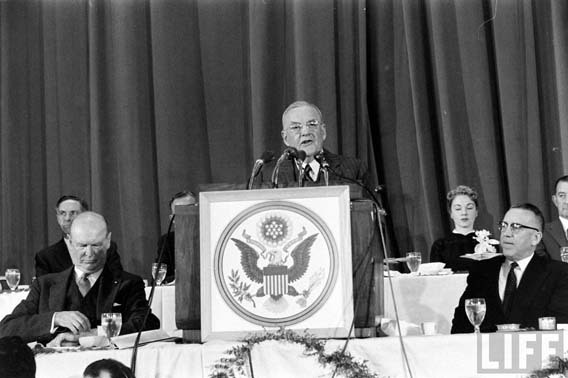 The Eisenhower administration had two significant objectives in mind when Dulles delivered an important address at the Council on Foreign Relations on January 12, 1954: (1) Avoiding another long, punishing land war in Asia; and (2) Avoiding budgetary red ink that would result from the maintenance of overly large conventional forces. The Eisenhower administration’s solution? A brief flirtation with the doctrine of massive retaliation. … to depend primarily upon a great capacity to retaliate, instantly, by means and at places of our own choosing. Now the Department of Defense and the Joint Chiefs of Staff can shape our military establishment to fit what is our policy, instead of having to try to be ready to meet the enemy’s main choices. That permits of a selection of military means instead of a multiplication of means. As a result, it is now possible to get, and share, more basic security at less cost. Massive retaliation was rolled back almost as soon as it was announced. The Eisenhower administration soon realized that an all-or-nothing approach to nuclear deterrence and nuclear war-fighting wasn’t very helpful, and that nuclear weapons were a poor substitute for conventional military capabilities. Smaller states with new-found nuclear capabilities have subsequently encountered similar dilemmas of relying on massive retaliation, but with fewer remedial options. Critiques of the U.S. doctrine of massive retaliation were never in short supply. Bernard Brodie (right), writing in Strategy and the Missile Age (1959), judged the timing of the Eisenhower administration’s new nuclear strategy to be “bizarre,” coming only a few months after the first Soviet test of a thermonuclear weapon. “Where,” Brodie asked, “would the government summon the courage – or brashness—for this kind of conduct?” Brodie subsequently (in War & Politics, 1973) creatively characterized massive retaliation as a doctrine of nonintervention. Other than the period immediately following the atomic bombings of Hiroshima and Nagasaki, has there been another time in our shared nuclear history where nuclear weapons have had greater salience in U.S. national security strategy? After Dulles’ speech, succeeding U.S. administrations sought safer ground, which paradoxically required more nuclear options, as well as heavy reliance on conventional deterrence and a new-fangled enterprise called arms control. Why return to this dingy corner of the shoe box? As a reminder of how far we have traveled to reduce the salience of nuclear weapons in our national security policies – and how far we have yet to go. I’m not saying that the argument I’m about make is compelling, but one favorable side effect of Massive Retaliation was money not spent, and conventional weapons systems not built. The lack of debt and the compounded interest not incurred is probably considerable. I also pose this as a counter question to the argument. Which would have deterred a Warsaw Pact invasion of the West more, conventional superiority or nuclear superiority? We know the nuclear option works when the West had nuclear superiority as well as sub-parity. This during a period of almost always trailing in conventional arms numerically. In a world stripped of nuclear weapons how many wars would we see? Look at how fast the US degraded into mindless military adventures after only 12 years from the end of is rival peer power. Look at how fast the American Right has stripped itself of its intellectual base and embracing ignorance after losing the check and balance of a nuclear foe. Good question, given that many of the USSR’s greatest successes in consolidating power and pacifying Eastern Europe came during at period when the USA had a monopoly or at least massive superiority in nuclear arms. Overwhelming nuclear superiority, at least for a time did nothing to deter Soviet expansionism. A very good point, however Soviet troops were already occupying Eastern Europe before the U.S. had a functional nuclear arsenal. Not to mention Eastern Europe was ceded to the USSR as payment for absorbing the German onslaught for the West. If I recall there were voices calling for attacking the USSR in a bid to liberate Eastern Europe during the time of American nuclear monopoly. Thank goodness they were not heeded. The point is still well taken. Perhaps what we need is a functional conventional arms control regime before we can make the transition to a nuclear free world. It’s not the Warsaw Pact armies of the 1950’s but the late 60’s thru to 1991. Where you have such massive and mobile conventional forces to hold at bay. Other than poverty, crushing debt, or nuclear arms, how do you deter such large and mobile armed forces? I love the pictures Jeffrey adds to my posts. My question: How did the woman manage to get that seat behind Dulles? One could maybe mount an argument that the Bush administration’s policy was the worst in that it expanded the coverage of deterrence like never before. Massive Retaliation was Soviet and Chicom centric, with the emphasis on the USSR. But under Bush the scope of deterrence was enlarged; even General Chilton had made some choice remarks about a potential nuclear response to a cyberattack. I wonder what’s worse; massive retaliation or this? “…an all-or-nothing approach to nuclear deterrence and nuclear war-fighting wasn’t very helpful…” And yet that’s all there is. Strategists have been dancing around this mulberry bush for over half a century with no progress. Either you cross the threshold into Armageddon, or you pull back. Any other approach to nuclear strategy is a dangerously tempting fantasy. The Lawrie Freedman quote suggesting massive retaliation was a retrospective blueprint for how the Korean War ought to have been fought is intriguing. This seems to suggest one of two policy prescriptions, but I’m not sure which he means. Either the United States should have done nothing. Or it should have employed massive nuclear force. Or is the suggestion that threats of massive retaliation would have supplied sufficient leverage to bring the conflict to a favorable conclusion? Some observations on Michael’s post. Forgive the length; just thought it would be useful to review the history. With respect to the apogee of nuclear excess, we can debate which era best exemplifies it, but we should remember how we got moving down that path. After the failed effort at international control of the atom and the successful Soviet test of August 1949, Truman’s early ambivalence toward nuclear weapons gave way to a harder attitude and a belief that the US had no choice but to achieve and maintain nuclear superiority over the USSR. This led to among the most significant decisions of his Presidency: development of thermonuclear weapons and a major expansion of capacity to produce nuclear materials. This latter decision often lives in the shadow of the former but resulted in the enormous expansion of the stockpile – from a reported 1000 weapons in mid-1953 to nearly 18,000 by the end of decade. Off to the races. With respect to Massive Retaliation as an expression of nuclear excess, here’s my take. In Eisenhower’s view, strategic nuclear forces and the SAC mission were the central and indispensable means of deterring Soviet aggression against the US or Europe. He was also determined to meet defense commitments at much reduced cost and did not wish to maintain large general purpose forces that would need to be deployed overseas. He was prepared to adopt a nuclear-dominant strategy as a means to rationalize defense requirements and contain costs. 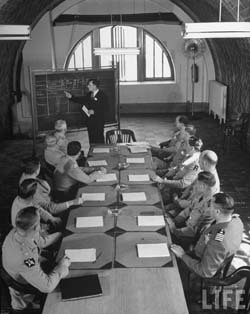 Such a strategy was codified in NSC 162/2, “Basic National Security Policy” (Oct 1953), which reflects the importance Eisenhower attached to the capability for an instant and large-scale reply to surprise nuclear attack or an all-out invasion of Western Europe – the forms of aggression he believed constituted general war. How strongly he supported the actual use of nuclear weapons outside the context of general war is not clear. Public statements of his suggest support for strictly military applications that would not put civilians or non-military targets at risk. Privately, he told the Joint Chiefs not to “plan to make use of these weapons in minor affairs” (as quoted in Bundy, 1988). Dulles’ speech, which emphasized the value of massive retaliatory power as a deterrent that extended to local conflicts and reinforced local defenses, was widely interpreted as suggesting the US would now respond to aggression anywhere with rapid and massive use of nuclear weapons. In fact, Eisenhower’s overriding concern was deterring general war as defined above: Soviet surprise attack or an all-out invasion of Europe. The words “primarily” and “instantly” in Dulles’ formulation referred to these contingencies and accurately reflect Eisenhower’s own convictions. The starkness and bluntness of this formulation was intended to convey a sense of maximum risk to the Soviet leadership and thereby limit the possibility of general war occurring as a result of the Kremlin’s miscalculation. Eisenhower believed the Soviet leadership was unwilling to run the risks of general war, and saw a strategy of massive retaliation as reinforcing their caution (also an argument Bundy makes). In clarifying Dulles’ remarks and the meaning of the new strategy, both Eisenhower and Dulles stressed that the goal was not to “turn every local war into a world war.” The US had at its disposal a wide range of response options, to include both tactical and strategic nuclear weapons. But no particular response was foreordained and the aggressor must remain uncertain as to its nature. Clearly, though, it was believed (hoped?) that the background presence of massive nuclear retaliatory power would raise the stakes for the Soviets in local wars; if such adventures became too risky, perhaps they could be prevented. Of course, massive retaliatory power might not deter the Soviets in local wars once US nuclear superiority had disappeared, and this was an eventuality that NSC 162/2 took explicit note of and that Eisenhower himself appears to have understood. This in fact became the central issue of contention over nuclear strategy a few years later, after the Killian, Gaither and other studies raised questions about the efficacy of strategy and war plans in light of growing Soviet capabilities. From this emerged the debate of 1957-60 between the emergent doctrines of “finite deterrence” based on a small, survivable SLBM force targeted at urban-industrial sites, and “no cities,” which emphasized counterforce targeting to limit damage.